As one of the leading insurers in Germany Die Techniker helps Expatriates to choose the right health insurance. A team of advisers assists you with all the questions you might have regarding the German health system. If you have your health insurance in a country which has a social security agreement with Germany, you can generally remain insured in your home country. All you need to do is present your insurance certificate from home, and they will take care of the rest. Make sure your health is in good hands when arriving in Germany! 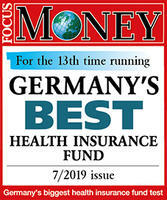 Fill in the contact form and an adviser from TK will get in touch with you shortly or download your personal copy of the Health Guide for Germany here.